There were 33 posts published in June 2007 (this is page 2 of 4). Some back and forth during the day about the Wowhead thing. First, Wowhead and John Maffei of Affinity have comments up on Wowhead regarding the sale. How can I believe any of this is true? I read on another site that a former employee says this is all false. John: I would strongly caution people not to believe all the rumors they read. For example, it came to my attention that the individual who leaked the story about the Wowhead sale supposedly not only owns competitive content properties but also is the partner in a successful RMT site. Like all Internet rumors, it is just that, but please consider the source when you hear damning stuff. Why not take a free shot at your top competitor. If the rumor above is true about the source of these comments, it is of course the height of hypocrisy. So you are sure Wowhead will not have gold ads now? John: 100% sure. Neither Wowhead or the ZAM Network have ever had gold or powerleveling ads, and they never will. We sold IGE. We are clearly separating our business from those practices. Why would we start running gold ads now? In response, the original blogger/ex-IGE employee noted the interview from just two days ago on CNet where Brock Pierce bemoaned the state of competing with the Chinese when running a gold arbitrage. Despite Affinity’s insistance that, you know, that this shouldn’t be a problem since, you know, they sold IGE off to the Gnomes of Zurich or Somali pirates or something. Of course, is Pierce CEO of Affinity, as he used to be? Or did he stay with IGE? Or does Dan Terdiman, the CNet interviewer, just not know what he’s talking about? Terdiman freely admits it’s probably the latter. When I was at the Virtual Goods Summit at Stanford yesterday, I had a talk with Brock Pierce, IGE’s founder, and he didn’t say anything about it. It’s true, he was wearing a badge from “Affinity Media,” and admittedly, I am not entirely up to speed on the latest news in this industry, but rather than suggesting IGE had been sold and Affinity was getting out of the secondary market business, he hinted he wanted to get out. Or maybe Terdiman’s actually on to something after all. now that IGE is out of the picture, Wowhead has decided to become a part of the ZAM Network. That last link is bothering some folks… according to the author (the former director of web acquisitions for IGE), Affinity is still very closely connected to IGE under the table. IGE has been ’supposedly’ sold off by Affinity Media. They used FUD when they purchased OGaming. They used FUD when they purchased Allakhazam. Just some more FUD – rest assured IGE/Affinity Media are still very connected. Discussion ongoing at FOH and F13. Why is this big news? For those unfamiliar with the World of Warcraft community (both of you) Wowhead is a quest/item database that was set up as a reaction to Thottbot (its direct analogue) being owned by IGE. Due to its being faster, and not owned by virtual mobsters, it rapidly became successful in its own right. By request, our European office has requested equal time for all the jobs that I’ve been pimping here in Austin. They need a wizard specifically, so if you are a networking and server wizard in the general area of England, they want to talk to you. If you are a wizard who casts fireballs and shadow steps, they may want to talk to you for different reasons. Julian Dibbell, friend to all RMT, writes for the New York Times on the emerging new markets in Chinese gold farming. At the end of each shift, Li reports the night’s haul to his supervisor, and at the end of the week, he, like his nine co-workers, will be paid in full. For every 100 gold coins he gathers, Li makes 10 yuan, or about $1.25, earning an effective wage of 30 cents an hour, more or less. The boss, in turn, receives $3 or more when he sells those same coins to an online retailer, who will sell them to the final customer (an American or European player) for as much as $20. 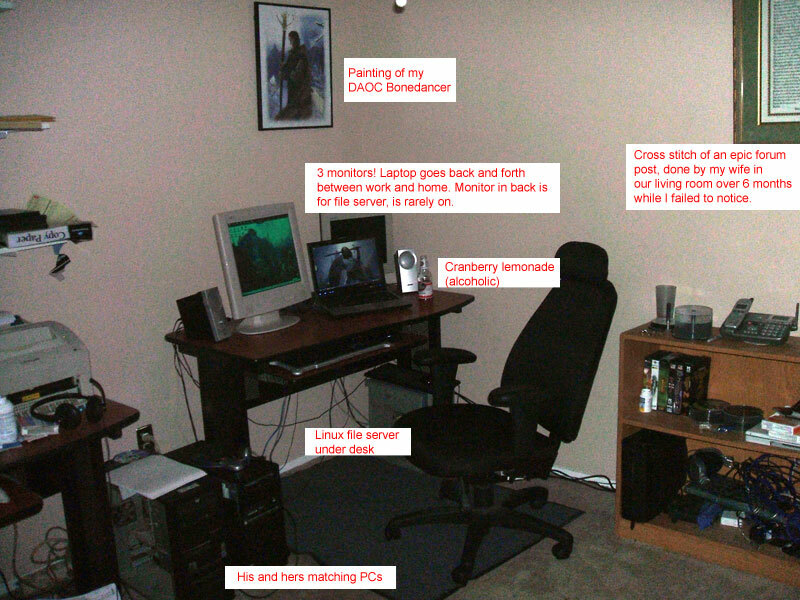 This one you can blame Cuppytalk on – what does my playspace (PC and videogame) look like? (Follow the link for trackback from other Bloggers That Must Obey All Memes). <Boogaleeboo> Your wife stitched something over the space of 6 months and you failed to notice? <Boogaleeboo> Dude you are SUCH a catch. Playnoevil has a link to a trade paper story in Russia about the author of a Ragnarok Online server emulator losing out in court and being sent “conditionally” to prison for 3 years. The damaged party claimed that Kiseliov had used an illegal copy of the ‘official’ server part’s code in its emulator. Kiselev protests that the emulator was written from scratch and is going to file an appeal to the Moscow City Court. One wonders what the “condition” involves. As a followup to the last post, a reader linked this article about why Eve is different. More than 3 million people have tried EVE. A fraction remain. Why? Probably because most of them want to play a game. And EVE isn’t a game. It’s a revolution. 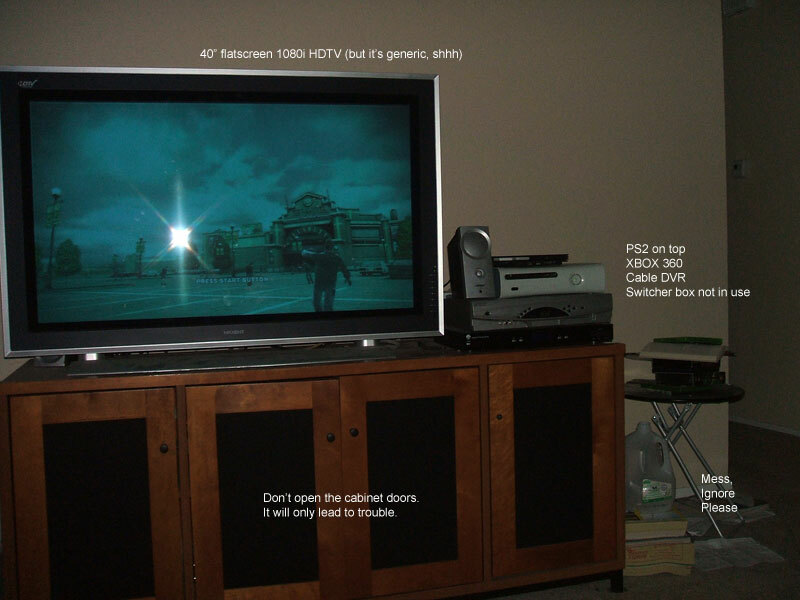 Online games and virtual worlds are not the same thing. If you’re building an MMO, you better be sure which one you intend to make. Funny. I thought virtual worlds WERE online games. I know, I know, the endless navel-gazing discussion of “game vs. world” that preoccupied myself and many of others for pretty much the first four years of UO’s conception, but that’s more political posturing than anything else (PvP! PK switch! Trammel noob!). What’s rubbing me the wrong way specifically, though, is that I think the waters are becoming very muddy as to what exactly makes “a virtual world”. The attention surrounding MMOs (massively multiplayer online worlds) has never been greater. But it’s not just role playing games along for the ride; non-game, avatar-driven virtual communities are just as popular, if not by more, and we’re not just talking Second Life here. By that, GigaOM’s list (which is seriously flawed, by the way: Webkinz is listed and Neopets isn’t? Ooookay then.) is defining games such as Habbo Hotel and Club Penguin as SL-style virtual worlds. What does Habbo Hotel have in common with SWG? Anything at all? Clearly, games like Second Life and Habbo Hotel and the like are social games. They exist primarily as chatrooms; some, like Club Penguin have game play, some, like Second Life, only have what the users bring with them. Are they virtual worlds, then? What is a virtual world? Let’s roll back a bit and look at what comes to mind when people think of VWs like SWG and UO. Open character development. Basically, you can make whatever character you can dream up. Complex economy. Ideally players make, buy, and sell everything. Few amusement parks. By that, I mean the guided gameplay familiar to MMO players. Amusingly, the few areas in SWG that tried to bring that kind of gameplay to the table were called “theme parks”. Ride the Sarlacc! Players can harvest, make, and build. Crafting, in other words, and intimately tied to the complex economy. Most involve players building entire cities of their own design, as their online “home”. Open player vs. player. Always a contentious topic, but advocates of Ultima Online especially point to its wild west atmosphere as a catalyst for community building. And… that’s it? Did I leave anything out? We’ll come back to the list in a second, but most people would pick something from the above when describing why they like VW-style MMOs. So, let’s look at a few games out today. Start with Eve Online. Open character development? Check. Complex economy? Oh lord, yes. Players can harvest/make/build? Yep. Open PVP? The game’s main selling point. Most people agree that Eve is a VW-style MMO. Next: Everquest (the first one.) Few amusement parks? Uh… the whole game’s an amusement park. Open PVP? Nope. But it starts to get fuzzy after that. Players can harvest/make/build? Well… kind of, yes. Not the quickest path to the cheese, but you certainly can. Complex economy? There’s a whole zone full of player-run shopkeeper bots. Open character development? At first glance, no. You’re a 20th level paladin. But at second glance? There’s a lot of post-max character development that’s been bolted on over the years. It might be an arguable point. Let’s get even more heretical. World of Warcraft? Pretty much the same arguments I made for EQ, since it’s a direct descendant. The economy’s fairly shallow, but it’s certainly active. Player crafting is the most simplified ever seen in an MMO to date — yet that simplification encourages everyone to dabble in it. There’s no open PvP UO/Eve style, but factional and arena PvP certainly exists. Character development’s fairly closed… but try asking people about their talent builds sometime. Would someone actually argue the case that World of Warcraft was a virtual world? So what the hell is a virtual world? Has the term been bandied about so much as a political punching bag that it’s now devoid of all meaning? I’d argue that one primary feature of a virtual world is context. Simply put, everything has a reason for being there. Monsters aren’t in an area simply because it’s the level 20 to 30 zone, they’re present because something *pushed* them there. Players, or migratory fluxes, or whatever – some context has been added. The game (and yes, they are still games, at least the type that we’re discussing) spends an inordinate time of not explaining how, but also why. And ideally, the players themselves start explaining the why. And that brings us to the other primary feature of a virtual world: player ownership. The players are the territory, to bastardize Marshall McLuhan. The collective creative mind of the player base can bring forth more compelling interaction than any non-VW MMO can ever hope to match. VWs have been – many times rightfully so – dinged for taking the carefree philosophy of “build it and they will come – and they’ll build it, so don’t build that much”. But it’s true. The best VW experiences haven’t been scripted gameplay, but gameplay frameworks. Toolkits for players to drive their own experiences, which often wildly diverge from what the game designer even conceived of. Anyway, I’m sure almost everyone reading this disagrees. The passion that drives VW discussions tends to do that to you. World of Warcraft actually is aimed at seven year olds. Allen Varney follows up his earlier NGE story for the Escapist with the coda of Jeff Freeman’s adventures in blogging, thus proving that it’s never wise to actually blog about what you’re doing at work, because enterprising writers will dredge it up years later to prove a point. Dozens of bitter young males, unfamiliar with the collaborative design of MMOGs, heaped daily scorn upon this water-carrier, this flunky, as the unstoppable mastermind of the entire NGE. Trust Journalism. Journalism is your friend.